Vanessa McDowell crafted her storytelling at SMU, CCCC, screenplay competitions and varies workshops across the US including Hollywood. She has a passion for the arts and frequently competes in writing contest. Audiences alike will be transported into the depths of Vanessa's mystifying mind that teases and toddles in the brinks of an undefined “imaginarium”. Her works are a must read for readers craving suspense, drama and heart pumping adventure. Casualty is like no other on the market. It’s The Fugitive meets Set It Off all wrapped up in one gripping journey you will not want to come back from. 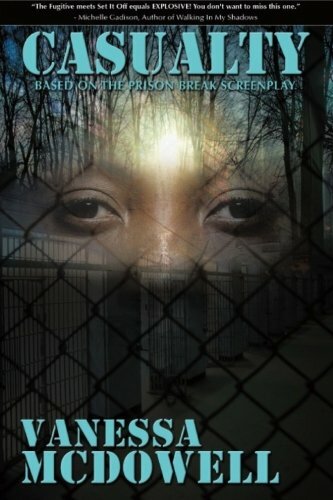 Summary / Description: A frightened grief-stricken woman escapes from prison and is hunted down. What if you were wrongly accused, sent to jail only to find you were on a path to a violent death within the walls that claimed your freedom? Would you try to escape? Logon Daniels does just that in this unpredictable jaw-dropping journey that forces her to struggle through devastating obstacles that will have you rooting for her to the very end. Available on iTunes - Click on the photo to purchase the eBook. Casualty tells the story of a young woman wrongly accused and sent to prison by a system that was supposed to protect her rights but failed to do so. The protagonists, Logon Denise Daniels, is befriended by three inmates at Gatesville Women Correctional Facilities in Gatesville, TX near Austin. When a gang called Butchers threatens to kill Logon she decides to escape to save her life. The author skillfully plots an escape plan for her wrongfully accused protagonist that leads her on a path of unpredictable destruction and near-death experiences including a deranged murdering lunatic on the loose. “You don’t want to miss this one!” says Michelle Gadison, Author of Walking in My Shadows. The book was released by the author and is now available through www.barnesandnobles.com, iTunes, Lulu.com, Blackbooc.com and other distinguished outlets. Cameo is about an obsessed 26-year-old woman named Langston Lu Daniels. She is obsessed with a movie star by the name of, Boston Bernard. Langston suffers from Bipolar Schizophrenia. During a time of grief, Langston stopped taking her medication causing her to suffer from delusions. She believes that she is the lead actress in Boston’s latest feature film, Cameo. In Langston's mind, she is the actress playing Boston’s love interest. So much so she stalks Boston and his real-life wife Lily until Langston becomes crazed with jealousy which makes her snap leaving her sister Helen to pick up the pieces. Langston creatively finds a way to take the couple hostage and tortures them. Casualty is available in all formats through Amazon, iTunes and other formats.